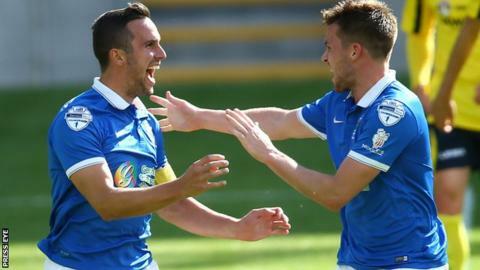 Andrew Waterworth bagged a treble as Premiership leaders Linfield maintained their 100% start to the season against 10-man Dungannon at Windsor Park. Aaron Burns flicked in to put the Blues ahead but David Armstrong headed in the equaliser on the restart before he was sent off for two yellows on 55 minutes. Linfield capitalised on the dismissal and Waterworth fired home twice before heading in to complete his hat-trick. Adam Sally added the fifth as the Blues stay top on goal difference. The game turned on Armstrong's exit with Dungannon good value for their leveller just seconds into the second half. The visitors were first to threaten with Sean Ward clearing Cormac Burke's shot off the line. Waterworth fizzed an effort wide before Burns scored his fourth goal of the campaign, hooking in on 18 minutes from Kirk Millar's corner. Paul McElroy blasted over for Dungannon and Millar side-footed wide before Armstrong's bullet header was blocked on the line by Jamie Mulgrew. Stephen Lowry rifled just wide before the break and the second half was less than a minute old when Armstrong netted against his former club with his header looping past keeper Ross Glendinning. Swifts keeper Andy Coleman tipped Mark Haughey's header onto the bar before Armstrong picked up his second booking in six minutes. Linfield moved in front two minutes later courtesy of Waterworth's turn and shot from Millar's cut-back. Millar saw a shot deflected wide before his cushioned volleyed struck the bar as the Blues seized control. Waterworth netted at the back-post in the 82nd minute and secured the treble with a close-range header six minutes later. Substitute Salley also headed home with ease in added time as Warren Feeney's side made it three wins from three games.